Home PDF Bitmap Wood Model Airplane Plans (1) PDF Bitmap Wood Model Airplane Plans (2) Pitts Special "Lil Stinker"
The Pitts Special "Lil Stinker" is 1.6 MB. Larger files take longer to load. This is the Pitts Special "Lil Stinker" listing page, here you can download the plan, article and see the main thumbnail and extra images. Model Airplane News's Pitts Special "Lil Stinker"
Curtis Pitts began the design of a single-seat aerobatic biplane in 1943–1944. The design has been refined continuously since the prototype's first flight in September 1944, however, the current Pitts S2 still remains quite close to the original in concept and in design. Several of the aircraft that Curtis Pitts built had a picture of a skunk on them and were called "Stinkers". After she bought it, aerobatic performer Betty Skelton called the second aircraft that Curtis built, "Lil' Stinker". 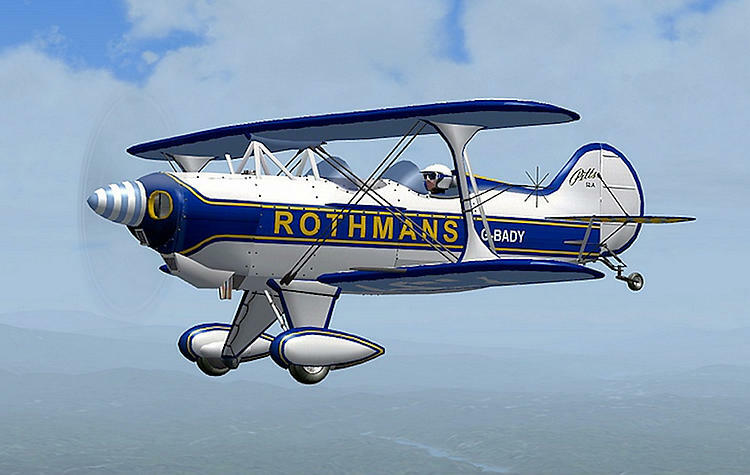 The prototype S-2, which was the first two-seat Pitts, was "Big Stinker", the prototype Model 11 (later called S1-11B) was "Super Stinker", and the prototype Model 12 was the "Macho Stinker". Betty Skelton's Lil Stinger now hangs in the Smithsonian Air & Space Museum. Please note center photo above. The control line model designed by Walter Musciano depicts Betty Skelton's "Lil Stinker" noted above. The model construction is typical Walt Musciano - very strong then beefed up some more. Constructed according to Musciano's plan the completed model will be capable of "planting" an engine and usually suffer only cosmetic scrapes. His model is powered by a Bantam .19 and notes that an engine up to a .33 can be used. Way back, about the time dirt was invented I built many a Musciano designed control line model and never regretted building any of them. Videos for the Pitts Special "Lil Stinker". These are the details for the "Pitts Special "Lil Stinker"" plan. If you would like to become a plan editor and help us to edit the attributes of all the plans in the website please click the "Edit Attributes" button below. Similar: Plans like Pitts Special "Lil Stinker"
Order your Pitts Special "Lil Stinker" prints today! The Pitts Special "Lil Stinker" plan can be printed on plain paper, tracing paper or polyester film and shipped worldwide. This tool allows you to calculate the cost of printing and shipping the Pitts Special "Lil Stinker" plans and its building article if available. If you need to resize a plan please contact us with the ID:83362 and the desired wingspan. Order 3D Printed Parts for the Pitts Special "Lil Stinker"
I will calculate a price upon request, please contact me here mentioning this PlanID: 83362 and the job you wish me to do. This plan is 1.6 MB and was shared by our member kenb on 09/04/2015 15:47 in the PDF Bitmap Wood Model Airplane Plans (2) category. It has been downloaded 767 times.